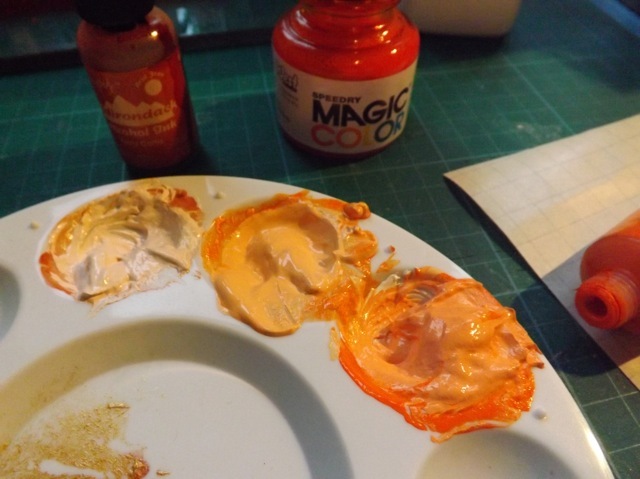 Well, although I was pretty sure I had seen someone someplace colour modelling paste with alcohol ink, I made the BIG mistake of mentioning it before trying it. When I DID try t I was disappointed with the results. DOH! So I took my little tub of past and had a methodical play with the things I thought would work to see how they performed. I took less than a 1/2 teaspoon in each well and mixed one with alcohol ink, one with acrylic ink and one with bog standard student grade acrylic paint. 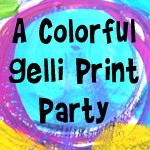 Pretty much in order of intensity – the alcohol ink was pretty pale but of the three adding the alcohol ink changed the consistency of the paste the least. 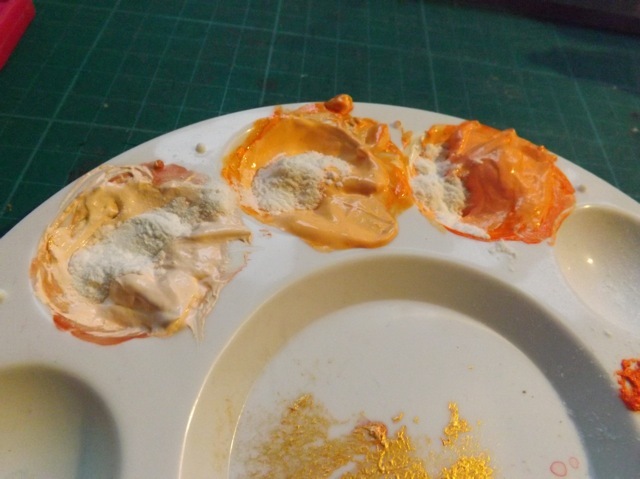 The acrylic ink made a VERY creamy mix, with not near the same body, but the colour was more intense. The paint left pretty much the same consistency and the colour was the darkest, although lighter than the original paint, as you would expect when mixing a colour with WHITE. To ramp up the body I added a smidge more talc to all three. That worked fine. 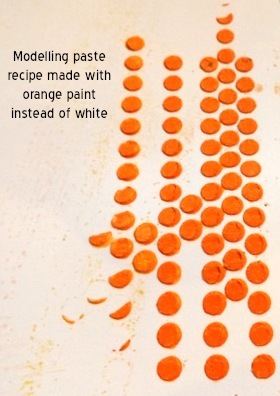 and the results when using the paste as intended? Hover (or click if on a phone or iPad) to see my comments, but really the photos speak for themselves! as you can perhaps see, the consistency is exactly like the original paste made with white, which should have been expected. And the colour is quite vibrant. It works perfectly – and it dried by the time I typed up this post, so maybe 10 minutes? Sorry for the dark-ish photos but DD is off school this week. We are going to the cinema so I really have to dash and the morning light + artificial light is rubbish. 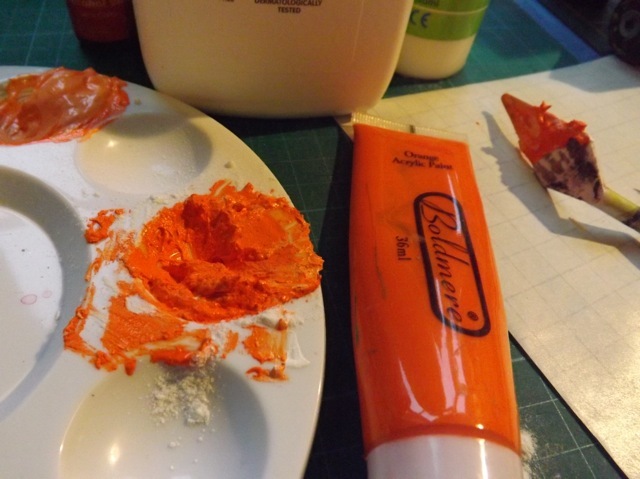 What I would say is if you want a true colour, mix up the paste with actual paint in the colour you choose. I mentioned in my long comment I think what I would do is mix up a bit of a colour for a project . Based on how much coverage I can see I would get even with what amounts to about a teaspoon of mix, you can do this on the fly as you need it. If there is a colour you think you want a lot of, or if you are doing something large and don’t want to risk any slight colour variation, mix up a couple of tablespoons on a palette (easier to scoop it all up with a credit card or palette knife) and pop it into the corner of a plastic bag (NOT a Zip lock one, a soft one) and knot it. I think you could keep it for a while, it’ll stay moist in the bag, and when you need it, just snip the corner off, pipe the paste onto the edge of your credit card/gift card/whatever and apply thru your stencil or smear on with your palette knife! You could try to re-knot the bag or pipe it into another bag if you still have some left. 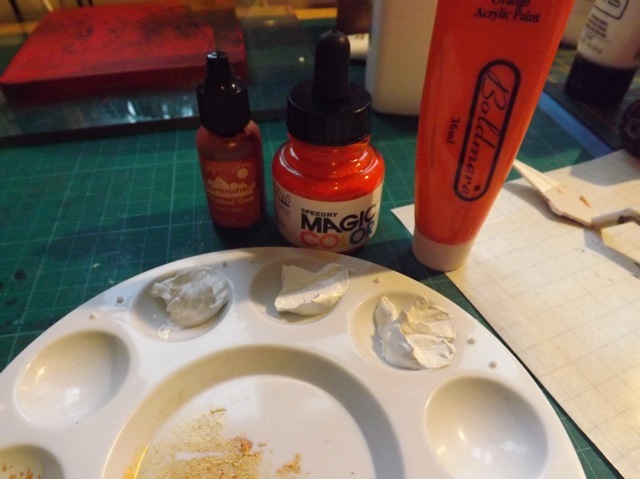 I’m interested to try RED paint, cause we all know red and white make PINK so am wondering how the colour will be affected by adding the white talc and white glue – the orange is pretty close to the colour in the tube, but RED and BLACK really are the true test….maybe after the movie…. 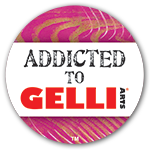 Categories: art journal, tips & finds, tutorial | Tags: art journal, art techniques, how-to | Permalink. Thanks for sharing this! I’ve read it earlier in my mailprogram and liked it, revisiting now and pressing the like button 😉 I haven’t run out of modelling paste yet, but when I do I’ll try your recipe’s. Pinning this one and will look for the recipe and pin that one too. Thanks for sharing your experiments! Somehow it never occurred to me that AI would work. I guess I’m not much of an AI fan, because it’s definitely not something I go to very often. Glad you proved me right. 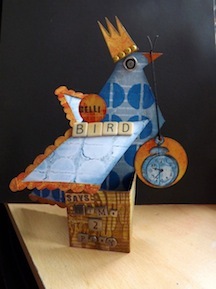 I so love your experiments – I get to understand the results without having the time to do these myself – always so happy to see another that works in such an experimental mode – I find it so hard to use patterns or kits or pre-designed set ups – I just gotta do it myself and I suspect that’s you too.